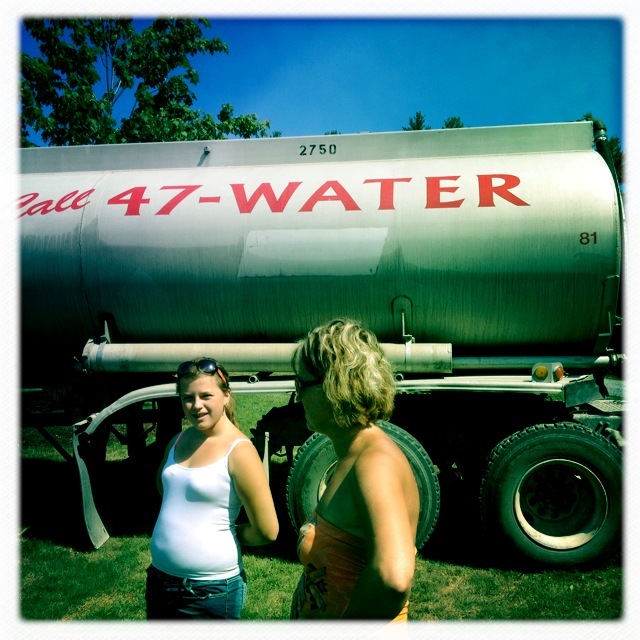 8,000 gallons of ‘Call 47-Water’ water didn’t make a dent. Contrary to all the dark n’ stormy photos you’ve seen of New York City in the past few days, here at The Muddy Kitchen, we have seen no rain since I planted brassica, which to you lay-farmers means basically your broccoli-and-cabbage-type things – cool weather vegetables, which means early spring. Now I don’t really love the rain; rain gear makes just about anyone look fat, has ruined many a vacation and more than one pair of expensive high heels, but as a grower of things, I have come to appreciate its value on the weather spectrum. Soon these apples became our babies. 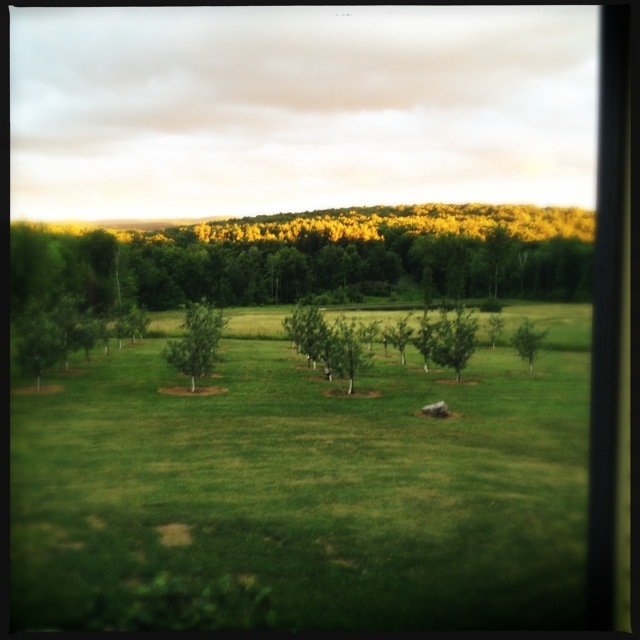 About three summers ago we planted apple trees. Our Tree Guy, Tom, a virtual poet of agronomy, got a decent deal on a large quantity of apple trees and planted a whole dang orchard of them. This was a little distressing to me at first and imagining what to do with two tons of apples each year was a bit mind-boggling. There were classes in cider-making and research on hard cider making (which of course involved a lot of taste-testing). 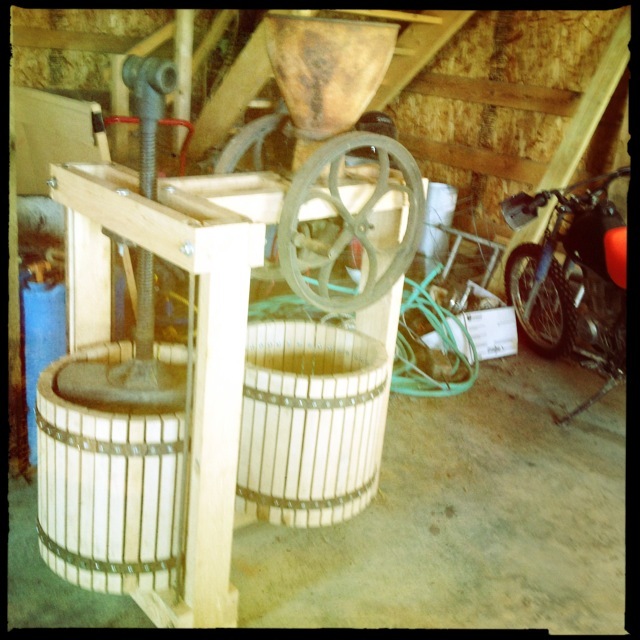 Our neighbor, Keith, unearthed an ancient cider press from the back of his barn and spent a good part of a few months refurbishing it to beyond even William Sonoma’s wildest dreams. I used a photo of the sun-dappled orchard when Facebook switched to Timeline and I needed a ‘cover’. I planted a patch of morels knowing their kinship to apple orchards. 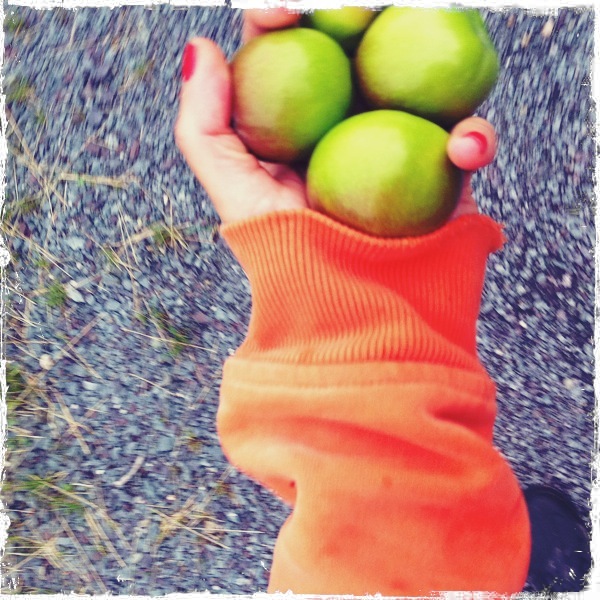 Soon these apple trees and I became attached. But Tom told us we needed to be patient with our apple dreams. The trees wouldn’t makes real apples for three whole years (Flash forward: this year.). Every now and then we’d drive the ATV (heretofore known as ‘The Machine’) throughout the orchard, examining blossoms, reporting back signs of grazing to Tom and fantasizing about our apples-to-be. Cut to: this summer and no rain. Everything in the garden was just about all fried up. I turned my hoses on, rode The Machine around to my various new peppermint plots and pumpkin patches, fetched my watering can and chased after the wilting leaves of one thing or another. Even the compost resembled some fly-attracting tumbleweed. The apple trees were thirsty beyond compare. So when Tom came up to feed them, he was risking life and limb (theirs) as he nourished their pint-sized, parched roots. Neighbors look on, amazed at what city people will do. Tom used, he now tells us, two tanks to feed the apple trees: one on the lower few dozen and another on the upper few dozen. Apparently one of the tanks was just a little stronger than the other. Sure enough Tom’s crap tank of apple food combined with the rainless heat and those trees didn’t stand a chance. Someone used the word ‘Hiroshima’ which makes me especially sad for so many more reasons than apples, but the reference is not lost – the trees just burnt up. Woosh. 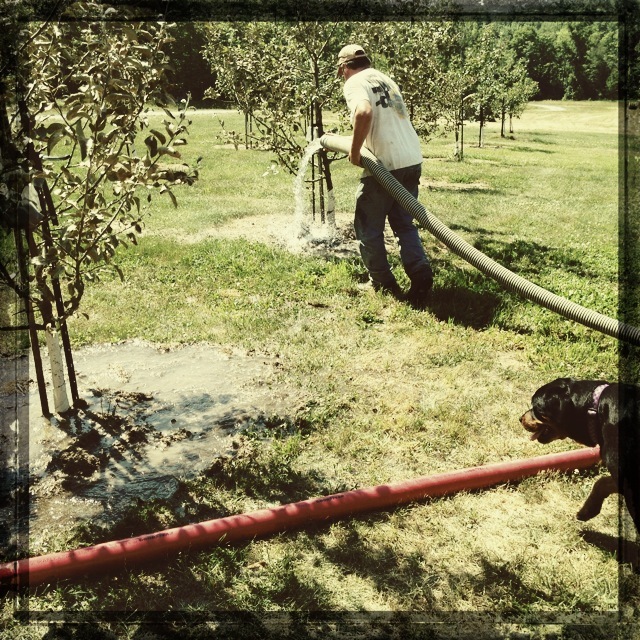 In a desperate attempt to resuscitate, we called 47-Water and the neighbors helped us hose 8,000 gallons into the orchard, but it was too late. Our dreams of too many apple pies and cases of hand-crafted hard apple cider with pretty labels were dashed. Tom feels terrible, surely; they were his babies too. But in the end, it doesn’t matter. The trees have gone to that orchard in the sky. Now on to plums. Apricots. Maybe a Morello Cherry. Next post: The Kachumber Cocktail – Are You Ready?